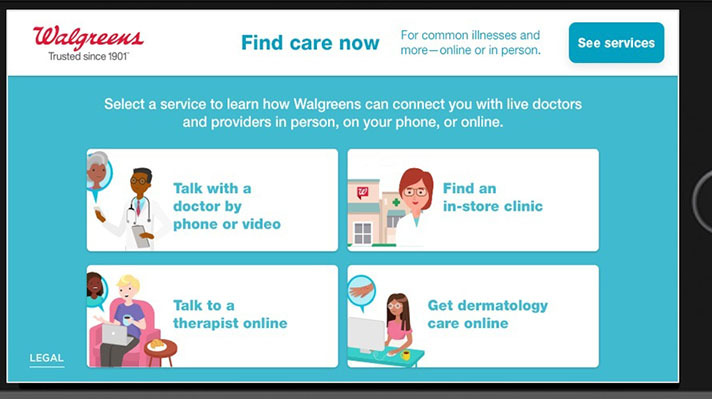 Walgreens Boots Alliance has launched a new digital platform, available through its mobile app and website, called Find Care Now. The service is designed to be a curated way to connect customers to a range of healthcare providers that Walgreens has partnered with, including telemedicine companies, digital-enabled house call companies, and more traditional providers. Seventeen partners are going to be available at the platform’s launch. The list includes just one generalist telemedicine service; MDLive, which has worked with Walgreens for the last four years. Other digital services on the list include online dermatology service DermatologistOnCall and on-demand house call service Heal (which will be available in California, Washington D.C., and Northern Virginia). Other than LabCorp, the rest of the list is brick and mortar providers like Advocate Health Care in Chicago, NewYork-Presbyterian Hospital in New York City, Providence St. Joseph Health in Portland, Oregon, and several more, with additional partnerships in the works, Monti says. Monti says the platform is a win-win — it will drive more patients and customers to the partner organizations, but he hopes the platform will also drive more traffic to Walgreens stores and apps, as well as build customer loyalty.